Jason Henderson, Associate Dean and Director of Extension, came on board on May 28. He has been busy working to meet as many College faculty and staff and stakeholders as quickly as he can (no small task!). I have really enjoyed the stakeholder meetings I have been a part of – they’re a great chance to re-connect with this group and dig into the question of how Purdue Extension can be an even better partner. Welcome aboard, Jason–we are excited to have you at Purdue! Last night, I attended the opening session of the Indiana FFA State Convention – 2000+ future leaders assembled in the Elliott Hall of Music for an incredibly high energy, rock concert-like kick off to their convention. Indiana 4-H has been on campus this month as well: more than 400 attended the 4-H Science Workshops and some 450 are expected here for 4-H Round-Up next week. The College is deeply involved in these events and so many more for our young people – thanks to all who make them happen. If you are involved in these events, you know they attract amazing young people – young people who need to fully understand the full range of educational opportunities available across the College. Led by Tomas Höök (FNR) and Brian Miller (Director IL-IN Sea Grant), Purdue hosted the International Association of Great Lakes Research Conference earlier this month. President Daniels kicked off this event that brought more than 700 researchers and graduate students from around the world to campus. We have an outstanding group of faculty, staff and students in the College working on issues of water and air quality, ecology, climate change, sustainability… It was great to see our work in these areas showcased at this terrific event; my thanks to Tomas and Brian and all involved! It has been a busy time for our Development team as well. Without getting into the details, we have booked another $2 million (with University match) in graduate student support and an additional $4 million in undergraduate scholarship support. Some of these were deferred gifts, made available to us through the estate of an individual who passed away. When it is not explicitly stated in these cases, I often wonder just who in Purdue Agriculture touched these individuals in a way that led them to decide to leave more than a million dollars from their estate to the College…and, who knows what good things will come down the road from our engagement with stakeholders and students today. Some days, the scope of what we do as a College is made very obvious to me. Last week, Provost Tim Sands, Dr. Bob Joly and I visited the lab of Distinguished Professor of Plant Biology Jian-Kang Zhu (HLA). Some amazing science was on display as he and his colleagues work to understand at the most fundamental level how plants respond to abiotic stressors such as water and heat. The next morning, I had a conversation with Janna Beckerman (BTNY) and Cliff Sadof (ENTM) about their new iPhone apps that literally make a tree/perennial flower/annual flower expert available on an iPhone. Pushing the boundaries of basic plant biology in the lab and the boundaries of education/information delivery in Extension – that is just what we do as a College. Of course, I have just scratched the surface of all that is going on in Purdue Agriculture. STAR is in full swing and we are welcoming our Fall 2104 class; county fairs are in starting up; researchers are readying grant applications to send to various funding agencies…. Many of you have likely seen the QS World University Rankings that placed our College number 6 in the world in the ‘agriculture and forestry’ category. We recently completed our annual unit review meetings – more than 30 hours of discussion with every academic department and service unit in the College (thanks to our Director of Financial Affairs Cherise Hall and the entire Business Office staff for making this process flow smoothly). Reflecting on the accomplishments of our faculty, staff and students showcased in these meetings, it is not hard to see why QS placed us where they did. While these kinds of rankings have their downside and they can be fragile, we should be very proud to be in the company we are in. Interestingly, the first question I received from an alumnus who learned about the QS rankings was “what do we need to do to move up?” (Alumni certainly help keep us humble.) It is a fair question, and one we will be asking next year. While our focus won’t be rankings, we will ask the question “how can we get better as a College” when we kick off our strategic planning activity this fall. My thanks to all of you who make this College a special place. Just about the only thing more exciting than where we have been and what we have accomplished is where we can go and the possibilities in front of us. It is going to be a lot of fun to work with you next fall and spring on outlining the next chapter for the College. The Graduate Research Spotlight highlights graduate students and their work. This month’s spotlight is on Rebecca Logsdon, Agricultural and Biological Engineering; advisor Indrajeet Chaubey. Tim Kerr began his new duties as Senior Assistant Director of Academic Programs in the Office of Academic Programs on June 1. He follows Dr. Allan Goecker in the position; Dr. Goecker is retiring at the end of June. Tim previously served as Assistant Director for Academic Excellence in OAP. "I believe Tim has the proven experience, ability, vision, and desire to capably serve in this critically important academic and administrative role," said Associate Dean for Academic Programs Marcos Fernandez. "All of us look forward to his leadership and successful appointment in his new position." Jeff Dukes, associate professor in the departments of Forestry and Natural Resources and Biological Sciences, began his duties on June 1 as Associate Director of the Purdue Climate Change Research Center (PCCRC). As Associate Director, he will play a key role in helping to shape and develop Center initiatives, priorities, and strategic direction. Jeff has been an active member of the PCCRC since joining Purdue’s faculty in 2008. His research group addresses environmental challenges through ecological research and outreach, with a current focus on three themes: understanding how ecosystems respond to climate and atmospheric change, understanding and minimizing the impacts of invasive species on ecosystems, and exploring the ecological consequences of switching our energy supply from fossil fuels to biofuels. Jeff has a particular interest in understanding how changes in climate and the atmosphere will affect the success and impact of invasive species. Food is an essential of life, whether in rural Indiana or rural Africa. As world population continues to grow, scientists must develop cropping systems that increase production for modern, domestic farms and also help subsistence farmers take more crop to market. The current issue of Agricultures features Purdue Agriculture discovery, learning and engagement programs that improve food security, increase farm income and teach modern crop science at home and abroad. The Feldun Purdue Agriculture Center, northwest of Bedford, Indiana, at the end of State Road 458, has been a part of the Purdue Agriculture System since 1914, and is the oldest farm in the system. The 1,180-acre operation has had many features over the years, including an apple orchard, a herd of dairy cattle and flocks of sheep and chickens. Today its main emphasis is on beef production. Joe Levell, academic IT specialist in the Biochemistry department, recently printed an RNA molecule on the department's new 3D printer. Joe was able to see the fruit of his labor in the hands of Nobel Laureate Venki Ramakrishnan thanks to Dr. Barb Golden, who took the molecule to a professional meeting in Switzerland and snapped the photo. An incoming Agriculture student is one of eight Purdue students, including four from Indiana, who have been awarded the Beering Scholarship, which covers full educational expenses for a bachelor's degree and the opportunity to pursue two other graduate degrees at the university. Sydney Deanne Rivera, Indianapolis, will join us in the fall, studying food science. The students were selected based on high school academic credentials and leadership skills, said Jennifer Dexter, senior assistant director and scholarship coordinator for the Office of Admissions. Beering Scholarship recipients can pursue one bachelor's degree, one master's degree or an MBA, and one doctoral degree at Purdue or medical school through Indiana University. The program also covers related educational expenses and a one-semester study abroad opportunity. A British company that specializes in information about higher education and careers has ranked the Purdue College of Agriculture sixth among agricultural institutions worldwide. Quacquarelli Symonds (QS) ranks learning institutions across the globe in 31 categories based on several metrics. The group selected the University of California, Davis, as the top school in the agriculture and forestry category for 2013. Thomas Hertel, Distinguished Professor of Agricultural Economics, has been chosen to receive the inaugural Purdue University Research and Scholarship Distinction Award. The award recognizes university faculty whose recent research or scholarship has made a major impact in their field and who are not eligible for the McCoy Award, which is limited to university research in the natural sciences. As the award recipient, Hertel will deliver the keynote address at the Purdue University Research and Scholarship Distinction Distinguished Lecture on Nov. 18. 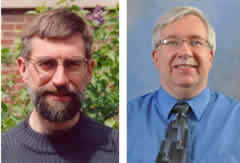 Richard Grant, Agronomy and Mike Schutz, Animal Sciences, have been selected as a CIC Academic Leadership Program Fellow for the 2013-14 academic year. The CIC Academic Leadership Program helps talented faculty further develop their ability to be effective academic leaders. Faculty participants are chosen by their home institutions, based on their proven abilities or demonstrated promise. Indrajeet Chaubey, Agricultural and Biological Engineering, has been appointed to a five-year term as head of Earth, Atmospheric and Planetary Sciences (EAPS) department in the College of Science beginning at the end of July. Dr. Chaubey will continue to hold a joint appointment between ABE and EAPS, with his primary appointment in EAPS during this period. 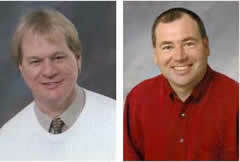 Bruce Applegate and Kevin Keener, Food Science, have been selected to participate in Purdue's 2013-2014 Entrepreneurial Leadership Academy. The academy, conducted by Discovery Park’s Burton Morgan Center for Entrepreneurship, teaches faculty members how to incorporate entrepreneurial concepts into their programs and identify potential commercial opportunities. Faculty members who complete the program receive a $5,000 development award and gain access to Discovery Park staff, equipment and resources. The National Science Foundation has selected an invention of Monika Ivantysynova and her group at the Center for Compact and Efficient Fluid Power (CCEFP) as one of the candidates for the Popular Mechanics Breakthrough Awards. The prototype displacement-controlled hydraulic excavator showed 40% fuel savings compared to a standard machine with control valves. This improved efficiency makes it possible to use a smaller and less powerful engine to do the same work, assuming an energy storage device is added. The annual Popular Mechanics Breakthrough Awards recognize the top people and products that have "dramatically advanced the fields of technology, medicine, space exploration, automotive design, and environmental engineering." The dissertation of Abigail Borron, Youth Development and Agricultural Education, was selected by the Association for Communication Excellence) as the best Ph.D. research study nationally. Abigail is currently an assistant professor in YDAE. This is the second year that a YDAE Ph.D. research study has been selected as the best one in the country. Last year's awardee, Inez Ponce de Leon, and Abigail both worked under the direction of Dr. Mark Tucker. A new group of graduate students representing the next generation of leaders that will tackle issues involving world hunger assembled at Purdue for the second Borlaug Summer Institute on Global Food Security. The two-week institute, hosted by the Purdue Center for Global Food Security, was held May 28 to June 8. Thirty-five graduate students from 25 U.S. universities, including Purdue, are in the 2013 class. The institute is a component of a five-year program to train U.S. graduate students in food security and global challenges in sustainable agriculture and related fields such as climate change, water, energy, economics, policy, technology and the environment. It is part of the U.S. Borlaug Fellows in Global Food Security program, funded by a $5 million grant from the U.S. Agency for International Development. Crop farmers will have the chance to reevaluate their farming operations when Purdue's Center for Commercial Agriculture hosts the annual Top Farmer Crop Workshop on July 8-10. 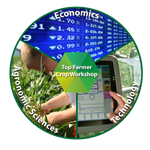 Participants will work with Purdue University and University of Illinois Extension farm management experts, as well as other university and industry experts, to look at their operations from a business standpoint - specifically economic, agronomic and technological opportunities and challenges. The workshop, now in its 46th year, will be at Purdue's Beck Agricultural Center. "The Top Farmer Crop Workshop is a good chance to see in one place a discussion of key issues in production agriculture today," said Michael Langemeier, Purdue Extension agricultural economist and associate director for the Center for Commercial Agriculture. Tomatoes grown around LED lights in the winter can significantly reduce greenhouse energy costs without sacrificing yield, according to a study led by Cary Mitchell, professor of horticulture, said the average tomato is shipped about 1,500 miles from warmer climates where they're grown to cooler climates that cannot produce the fruit cost-effectively in the winter. That journey is costly, however, because tomatoes are picked green and ripen during shipping, decreasing quality and flavor. The lengthy shipping distance also adds to the industry's carbon footprint. "It makes it really hard for the greenhouse industry to grow tomatoes well in the offseason. We're trying to change that and make it affordable," Mitchell said. Mitchell and doctoral student Celina Gómez experimented with light-emitting diodes, which are cooler and require far less energy than traditional high-pressure sodium lamps used in greenhouses. Purdue Extension continues to help Indiana melon growers produce the safest food as possible after an outbreak of salmonella last year, scheduling workshops that will provide information they will need to prepare for expected federal inspections. Following the outbreak of salmonella traced to a southwest Indiana cantaloupe producer in 2012 and an outbreak of listeria in Colorado the previous year, the U.S. Food and Drug Administration has announced that it will inspect cantaloupe operations nationwide. Inspections are expected to include sites in Indiana. The goal of the workshops, to be held during the week of June 17, is both to provide information concerning food safety as it relates to packing lines and packinghouses and to help cantaloupe growers prepare for inspections, said Scott Monroe, agriculture and natural resources Extension educator in Daviess County. The workshops, open to all cantaloupe and watermelon growers, are being held in Jackson, Knox and Posey counties to reach as many growers as possible. A webinar that instructs food entrepreneurs on how to follow regulations for home-based vendors is available at Purdue Extension's The Education Store. The three-part webinar titled "Cooking Up a Food Business in the Home Kitchen" addresses how to comply with a 2009 law allowing home-based vendors to sell nonpotentially hazardous foods to the public at farmers markets and roadside stands. It also explains the science of foods and details sanitation practices. Each part includes a question-and-answer section. "Because we've seen such an interest in farmers markets, entrepreneurs need to really think about the liability that they are taking on by producing foods in their home" said Katie Clayton, a Purdue Extension outreach specialist in food science. The webinar is beneficial to people interested in becoming home-based vendors as well as to current vendors who might want to make sure they are complying with state regulations. New mobile apps by Purdue Extension specialists can guide home gardeners in the proper care of their plants with the help of treatment methods based on proven research. The Annual Flower Doctor and Perennial Flower Doctor apps for iPhone, iPad and iPod Touch can help home gardeners with dozens of problems for more than 200 plants. The apps are available for 99 cents each. The apps build on Purdue Extension knowledge, using more than 400 high-quality photos that allow users to match 200 different plants with thousands of plant problems. The problems are ordered based on how common they are in Midwest gardens and yards. 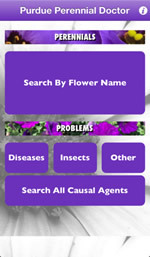 Once diagnosed, the apps guide users through methods to manage affected plants. Janna Beckerman, Botany and Plant Pathology and Cliff Sadof, Entomology, are content specialists for the apps. The full impact on the U.S. pork industry of a merger between Smithfield Foods - the world's largest pork producer - and Chinese firm Shuanghui are not yet known, Purdue Extension agricultural economist Chris Hurt says. If approved, the merger could provide new market opportunities for U.S. hog producers and also offer Shuanghui the opportunity to adopt Smithfield's health, sanitation and environmental standards. "The largest potential advantage for the U.S. pork industry is that Shuanghui is the largest processor and distributor of meat products in China," Hurt said. 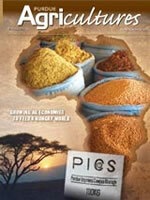 "China is the largest producer and consumer of pork. At this early stage it is unclear if this merger will result in more U.S. pork products being exported to China. However, this clearly opens the trade door for increased business to China, which already was the third-largest destination for U.S. pork in 2012." But the merger isn't without risks, he said. Large corporations can sometimes fail to adapt to quickly changing global markets. It also brings up concerns among U.S. producers and consumers about the loss of U.S. ownership and what that means for U.S. control. Consumers interested in buying Indiana-grown food products can now place their orders online through the Hoosier Harvest Market food hub organized by Purdue Extension. Complementary to farmers markets, Hoosier Harvest Market is a cooperative through which consumers can order locally produced foods at any time on a website. "In a way many of our neighbors in surrounding states already enjoy, Hoosiers will now have the opportunity to access preferred foods locally and support their local producers directly through a virtual marketplace," said Roy Ballard, Purdue Extension educator in Hancock County and an organizer of the service. Purdue Extension's popular Corn and Soybean Field Guide is now available in an interactive iPad app format. The app, available through The Education Store, is based on the publication's print version but includes new multimedia elements. "This adds depth because the app includes video clips of scouting techniques and high-quality images of plant pests, diseases and nutrient deficiencies that make it easier for a farmer to diagnose a problem in the field," said Bob Nielsen, Purdue Extension corn specialist and contributor to the guide. The app was developed by 3iD, located in the Purdue Research Park of West Lafayette. The Purdue Crop Diagnostic Training and Research Center provided all of the research-based content. Rhonda Phillips, associate dean of Barrett, The Honors College of Arizona State University, will be the dean of Purdue University's new Honors College. "Dean Phillips will provide the leadership that will help the new college move forward, focusing on academic excellence and attracting high-achieving students," said Timothy Sands, executive vice president for academic affairs and provost. Phillips, who has been in her current position since 2011, also is a professor in the School of Community Resources and Development at Arizona State. She holds appointments as senior sustainability scientist in Arizona State's Global Institute of Sustainability/School of Sustainability, and affiliate faculty in the School of Geographical Sciences, Urban Planning and the School of Public Affairs. Purdue President Mitch Daniels has named Suresh Garimella as the university's chief global affairs officer, effective immediately. Garimella has been associate vice president for engagement. He also is the R. Eugene and Susie E. Goodson Distinguished Professor of Mechanical Engineering. In his new role, Garimella, who reports directly to Daniels, will develop partnerships with international institutions of higher education and, in collaboration with Purdue Research Foundation, with global businesses. He will support international connections for Purdue faculty and researchers. He also will oversee International Programs, including International Students and Scholars and Study Abroad. Additionally, Garimella will guide Purdue's Global Policy Research Institute, assessing its strengths to date and helping it build upon its work on projecting the influence of faculty research nationally and internationally. The latest offering in Purdue's BoilerBackpack storage suite, researchBackpack, offers researchers 100 gigabytes of file storage and eliminates limits on the number of files that can be stored. Users of ITaP's research cluster supercomputers were limited to 5 GB of home directory storage. BoilerBackpack offers 100 GB of free space to all faculty, students and staff. Purdue has been named a Tree Campus USA by the Arbor Day Foundation for the fourth year in a row. Tree Campus USA is a national program created in 2008 to honor colleges and universities for effective campus forest management and for engaging staff and students in conservation goals. Purdue achieved the title by meeting the five standards outlined by the Arbor Day Foundation: maintaining a tree advisory committee, using a campus tree care plan, dedicating annual expenditures toward trees, holding an Arbor Day observance and organizing student service-learning projects. Weekly “Coffee Break Consultations” with ITaP Research Computing (RCAC) staff are informal meetups with benefits for new and experienced high-performance computing users or faculty, staff and students just thinking about adding the tool to their research toolbox. More information is available at www.itap.purdue.edu/newsroom/detail.cfm?newsId=2788 or by emailing rcac-help@purdue.edu. Purdue University is a community where diversity is valued and incidents of hate and bias are not tolerated. Students, faculty, staff, and campus visitors who feel that they have been the victim of a bias related incident (or who have witnessed a bias related incident) are encouraged to report it online at www.purdue.edu/report-hate or to contact the Office of Student Rights and Responsibilities at 765-494-1250. Your report can remain anonymous if you wish. Remember, if it is an emergency situation that requires immediate medical or emergency services attention, please call the Purdue University Police Department at 911 or 765-494-8221. Purdue University is an equal opportunity employer.